From the executive producer and director who brought adoring fans the hit popular series, “Power Rangers,” Koichi Sakamoto will bring to life the next generation of superheroes with a new action drama, “GUNBLADE.” The highly-anticipated show will be unveiled during the 2014 Licensing Expo at Mandalay Bay Convention Center on Tuesday, June 17. During the three-day tradeshow, visitors of the Kocca booth will experience an exclusive eight-minute sneak preview of “GUNBLADE” and will also have the opportunity to interact with one of the superheroes. Produced by Gunblade Culture Industry SPC, a South Korean-based production company and a subsidiary of A mate Inc., “GUNBLADE” is the tale of the extraordinary “Gunblade Team,” a six-member special missions unit, assembled to protect and defend humankind against the evil Dr. Dexter and his super computer, “Olympus.” Seeking assistance to carry out his diabolical plan to destroy the Earth, Dr. Dexter resurrects an ancient destructive clan, “Gothic,” who had been sealed away for evildoing. Now with the threat of humanity becoming extinct, the Gunblade Team must stop Dr. Dexter from destroying the Earth. Equipped with the “GB Drive,” a special smart phone type device, GUNBLADE members can use its applications to transmit high-tech weaponry, assist in a variety of attack skills, garner protection by an impenetrable shield and even transform into a special armored suit. The $20 million budgeted production is scheduled to begin filming this August and will be on-air in Korea as early as March 2015. 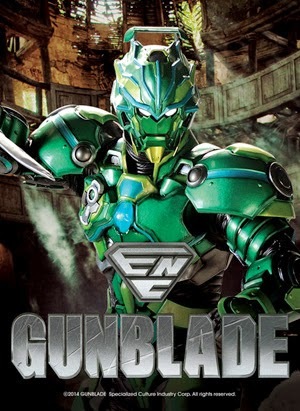 “GUNBLADE” will be distributed throughout select Asian markets in June and September 2015 and is planned to air in Europe and the United States by January of 2016.